A note: a lot of this is based on what Linda Berens thinks, feel free to dismiss it if you find you disagree. Determining your Interaction Style can help narrow down your type. If you manage to settle on just one, you've only got four left to choose from! Each of us has two other opposing pairs of innate preferences. In our communications we prefer either Directing or Informing. In our interaction with others we prefer either Initiating or Responding. Directing communications have a time and task orientation with an implication of urgency to get the task done. "Have your report to me by close of business today." Informing communications are designed to enroll the other in the process by providing motivation with relevant information. "Your report is an essential part of our project." The directing style of communication is easiest to spot. The extreme form is the style used by traffic cops, stressed parents, and military commanders. It includes communications that would be classified as a "direct order." Examples include: "Sit down", "Put it over there", "Clean your room." The informing style of communication is harder to detect. Sometimes those with the directing style are simply oblivious to it, not recognizing that a defining interaction just transpired. Extreme forms of this communication include messages that might be classified as "victim talk." Examples include: "I don't have any money", "That music is so loud", I'm not feeling good." Initiating types are more comfortable with making the first contact and establishing role relationships. They like to engage others in interaction and conversation and are more fast paced. Responding types are more comfortable letting others initiate contact and accepting the roles established by others. They are more slow paced and are comfortable with silence. All introverts prefer the responding communication style. This is often a simpler yardstick than choosing between "gregarious" and "shy," which is how extraversion and introversion are sometimes defined. The "responding" communication style simply means that other people are more likely to start up a conversation with you than you are to start up a conversation with them. It's all about who goes first. In contrast, extraverts are "initiating" types, which means they tend to initiate dialogue more often than "responding" types do. That doesn't mean extraverts can only initiate and introverts can only respond -- it simply reflects what each type is more inclined to do. Choosing a Temperament also narrows down your possible type to just four. We often relate to more than one temperament pattern because each pattern has something in common with the others. These things-in-common reveal themselves in the interactions between people, especially in our communications. As you try to sort out which temperament is the best fit for you, you may identify a preference for one or the other of the dynamics that are at play when the temperaments interact. Thinking and talking about tangible realities backed up by sensory observation. Free �thought time� is likely filled with reviewing events, facts, images, memories, and how things look, feel, taste, and sound. Once you have both an Interaction Style and Temperament, cross-reference them from this table and you should land on a type! Your last resort (apart from abandoning this whole enterprise and dismissing it as a waste of time, of course) is to start investigating the cognitive functions that help describe the generalized behaviours of each type. Unfortunately, there's so much information on Cognitive Functions that they're hard to sum up quickly! Instead, I'm going to post some links to other sites that investigate how the different functions help to define the different types. Happy reading! Just remember: the functions do not operate independantly of each other, and type behaviour is best understood as greater than the sum of its parts. Aaah. 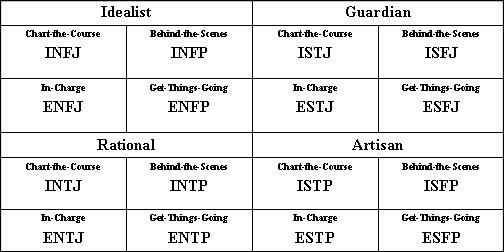 Well, that confirms INTP for me. Thanks. Yeh, I got INTP too. I had to take 'Behind-the-Scenes' because it fits me far better. I'd never call myself excitable, and I'm not normally the most enthusiastic or energetic. I only really get things going if I'm interested or see some potential in them, and even then inspiring isn't done in a jumpy way. And like many INFJs and ENFPs would I chose "Rational/Theorist", because dominant Ns are primarily focussed on understanding and competence. Though really I can't choose any of them, because my goal is just to get it and see it all. The theories are useful, but without prior knowledge of the things we all know, and without experience of the generalisations and what we should choose, I'm not sure people will choose the right options. You should focus more on the dichotomies that determine the temperament and interaction style, not just the general descriptions. I was just simulating what someone new of a similar type would see. In terms of the dichotomy I'm on the F side. And in terms of motive I do fall into the NF one rather than the NT one. I also fall on the E side of the first dichotomy. Directing/Informing - At this point in my life, it's pretty much a toss-up; I do a lot of informing and I do a lot of directing. In high school, when I was more in touch with Fe, I was more Directing, though, and this is still what I prefer from myself and other people. Initiating/Responding - I'm so Responding that it's pathetic. Abstract/Concrete - I'm perfectly capable of talking in concrete terms, but my speech (and certainly my thought process) tends toward the abstract. Affiliative/Pragmatic - Based on those descriptions, I'm Pragmatic, which is problematic. Yes, remember to think in terms of preference rather than ability. Directing/Informing - Informing, I hate being Directive even when I've had no choice. Initiating/Responding - Like Nunki, I'm so Responding that it's pathetic and I even frustrate myself because I can't get past it. Abstract/Concrete - Abstract without a doubt, although I force myself to go Concrete as a communication point with S-types and also to support abstract judgments. Affiliative/Pragmatic - Pragmatic by nature, but I've worked really hard to develop affilative behavior over the years. The less neurotic I got, the more pragmatic I became again. No offense, but this is the same grouping as Ygolo's. ENTPs have nothing in common with ESFJs or ESFPs. If you insist they are part of the same group, then you are denying reality. The fear of poverty turns people into slaves of money. Conquer your inner demons first before you conquer the world. [SJ] Check your type before you wreck your type – are you an ISFJ? By Infinite Bubble in forum What's my Type?